It is amazing to me how much attention is directed toward the difficulty opening the hard plastic packaging (also called the Blister Pack) that so many products come sealed in. It is evident by the attention that it gets , that a lot of people are bothered by it. It even has it own terminology. “Wrap Rage” There is solution, the Zip-it Opener. 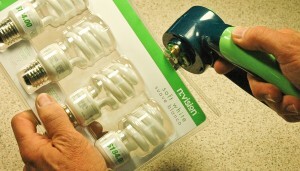 It will easily open most Blister Packaging if the included directions are followed. You must remove the translucent cover before starting, and use new batteries. The other trick is to not let it cut too deeply into the package. If the seal is not near the edge, it might take a couple of cuts down the sides to get to the seal, but it is safe and easy to use. It also leaves the edges smooth so you will not get cut by the packaging. It is hard to believe, but It actually makes these packages fun to open. Looking For Ways To Open Hard Plastic Packages? Live would be easier if I could use a Zip-it. Are you looking for ways to open hard plastic packages? They are a hugh problem, but we have found a way. The battery powered Zip-it Opener does it not by force, but by carefully cutting open the package from the side. Pressing one button on the large easy to grip handle activates the roller blades to effortlessly open the package. The battery power of the Zip-it does all the work. Anyone with arthritis will find this product a life saver for opening their mail and hard plastic bubble packages. Feel liberated, you can now purchase those products that are packaged in those hard to open packages. You can now open them easily with the Zip-it Opener. You no longer have to worry about using sharp knives or scissors that are difficult to hold. The Zip-it offers you a safe and easy to use opener for those difficult plastic packages and for opening your mail. This cow is looking, but unfortunately, cannot use a Zip-it.